Please scroll down to the bottom of page and take the time to read thru all information. 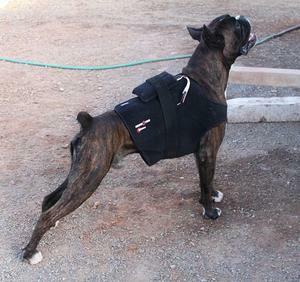 Health Testing is a very important part of Breeding Boxers. It is important that all dogs entering in a Breeding program should be Health Tested Prior to Breeding for the benefit of the breed. 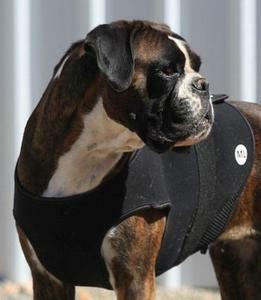 Completing these tests we can only hope that it will eliminate some problems that can be present within the Boxer Breed. Ethical Registered Breeders are Aware of the Available Tests that can be undertaken to ensure All Breeding Stock are of Good Health before Any Breeding takes place. Heart Testing to be Certified is usually around 18mths - 2yrs. All Our Dogs have been Health Tested and have Passed with Excellent Results at the time of Breeding.  Tests Completed are displayed on this page below and on their own Profile Pages. Health Conditions that can be present in the Boxer. One of the most common causes of sudden/unexpected death in boxers. (young & Old). This condition is thought to be inherited. It involves the heart to beat erratically by abnormal heart rhythms involving the ventricles (the main blood pumping chambers) of the heart which can result in weakness, collapse or sudden death. It is important that all breeding stock are properly screened for this disease by a Yearly 24hr Holter Test. 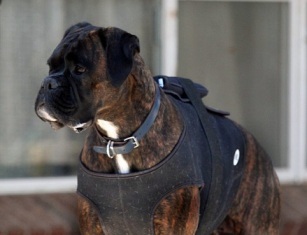 In the Boxer Dog less then 50 (PVCs)/24hrs is considered Normal. Greater then 50 PVCs, but less 300 with no triplets or runs are equivocal. When Tests are Completed it will be added to each dogs profile page. Photo's below show our dogs are happy to wear the Holter Machine for 24 hours. On the 30th of April 2009 Veterinary Cardiologist Dr Kathryn M. Meurs from the Washington State University discovered 1 mutant gene for Boxer Cardiomyopathy. (ARVC) Arrhythmogenic Right Ventricular Cardiomyopathy. At this stage they do not know if this is the only mutation in the Boxer or if there will be many different mutations. Cardiomyopathy is one of the most common form of heart disease in Boxer dogs which causes sudden/unexpected death in boxers young and old. Due to the recent discovery of this mutant gene Kriscross Boxers is going to take advantage of this new test and will be testing all breeding dogs. If future developments are made in this area we will continue to support this program and will test further. Kriscross has tested the following dogs for the (ARVC) Gene Test. Aortic Stenosis/sub-aortic stenosis (AS/SAS) :Is one of the most common heart defects occuring in boxers. Stenosis is the narrowing of the aorta, right below the aortic valve, which forces the heart to work harder to supply blood.. Reduced blood flow can result in fainting and even sudden death. Diagnosis must be made by a veterinary Cardiologist after detection of a heart murmer. Breeding dogs must be properly screened for this disease and affected dogs must not be bred from. Only a veterinary cardiologist, who has received training, has passed post-graduate examinations is able to give a true grading for breeders. Dogs with Grade 1/6 and 2/6 murmurs are generally considered to be "Mild" are very unlikely to develop any symptoms and should lead perfectly "normal" lives. Dogs Graded 2/6 Not recommend for breeding and should only be consided to 0/6 dogs. Grade 3/6 and 4/6 murmurs are generally considered to be "moderate". The majority of dogs with Grade 3/6 and 4/6 murmurs are also unlikely to develop any symptoms, but a small number will go on to become symptomatic. Dogs Graded 3/6 & 4/6 Should not be considered for breeding. Grade 5/6 and 6/6 murmurs are generally considered to be "severe". 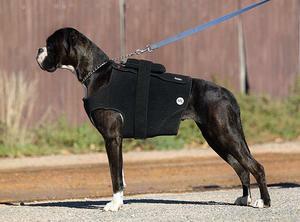 Degenerative Myelopathy (DM)is a slow progressive wasting disease of the hindquarters. (DM) is similar to multiple sclerosis in people and it affects the central nervous system which consists of the brain and spinal cord. The central nervous system is responsible for carrying nerve impulses or messages to and from the muscles. Axons carry these messages and are similar to electrical wires. As with electrical wires, axons require insulation and without insulation the message leaks out. In the progression of DM, the myelin sheath (insulation) on the axon is damaged or slowly destroyed rendering the muscle incapable of carrying out a movement.= spinal weakness and paralysis. However as with the ARVC DNA testing , DM testing should not be over-emphasized and is another factor in health testings that is available in the U.S.A. It is another form of DNA testing that is available to maintain or improve in a good breeding program. Thyroid Disease in the Boxer describes Hypothyroidism an inactive thyroid gland which can be responsible for conditions such as epilepsy, hair loss, obesity, lethargy, hyperpigmentation and other skin conditions or show neurologic problems. While not considered life threating the quality of life for a dog suffering from hypothyroidism is much reduced. Hip Dysplasia is thought genetically determined but this has not been established as enviromental factors such as nutrition and rapid growth and over excercise of a young dog can play a major role in its development. 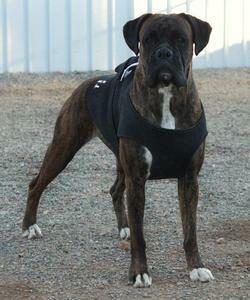 While some are questioning the frequency and severity of hip dysplasia in the boxer, alot are testing for this. It is a malformation of the hip joint leading to osteoarthriitis. The hip joint is a ball and socket joint where the top of the thigh bone (femur) fits into a socket in the pelvis. Hip dysplasia occurs when the socket is poorly formed or the ligaments are loose enabling the ball of the femur to slide part way out of it's socket. Hip dysplasia is a progressive disease which becomes worse with time. Cancer : Boxers are particularly prone to skin tumours most are harmless but veterinary advice is advised. Boxers with white markings and white boxers should be protected from the sun. 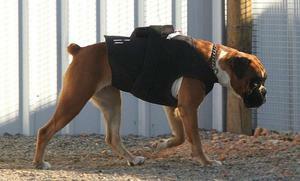 Allergies : Boxers can be prone to allergies which can be enviromental or food related. These often show up with itchy scaly and sometimes infected skin. Boxers do not tend to do well on foods that have a high grain content (corn/wheat). Best advice is to follow your breeders food guide.